*Some products were kindly sent to me for review, I have subsequently chosen to include them in my Christmas Gift Ideas list. All opinions are my own. I hope you enjoy them as much as I have. Summer is over, Halloween and Bonfire Night have both been and gone. That’s right, it’s that time of year again folks, the time of year where we spend hours walking up and down the high street and perhaps even more time scouring the internet looking for that perfect gift to put under the Christmas tree. I officially declare Christmas shopping season OPEN! Whether you’re looking for a gift for a loved one, a friend or perhaps a colleague for the office secret Santa, I’m here to help. This week I’m sharing my Christmas gift ideas for Gin Lovers. If it’s one thing I know, it is gin. 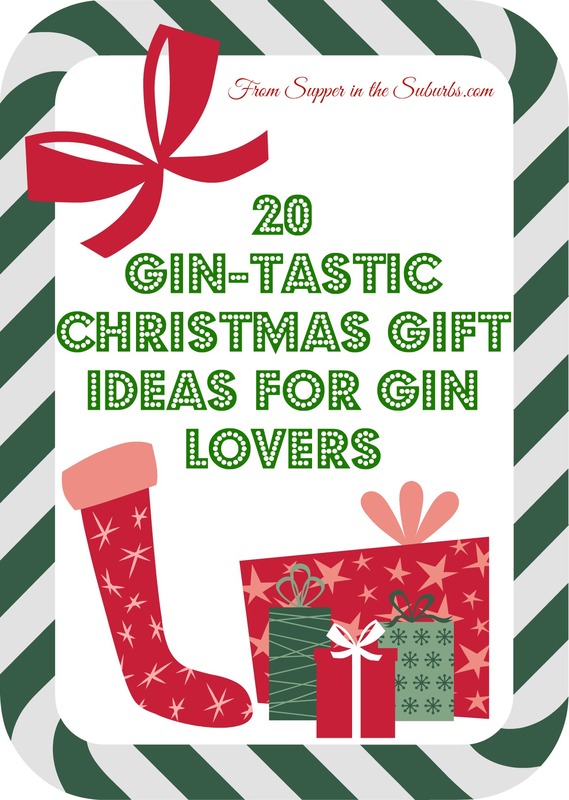 As a self-confessed gin lover I would be happy to receive ALL of these gifts which is why I’m happy sharing them with you. Here you will find presents starting from just £4.00 all the way up to £110.00 so there’s bound to be a gift idea here that your gin swilling friend will love. I’ve covered off home ware, bar ware, toiletries, edibles, fashion and of course gin itself in this comprehensive guide to Christmas Gifts for Gin Lovers! If gin is my first love, popcorn is my second. These tasty morsels will be polished off before the roast potatoes have even gone in the oven! 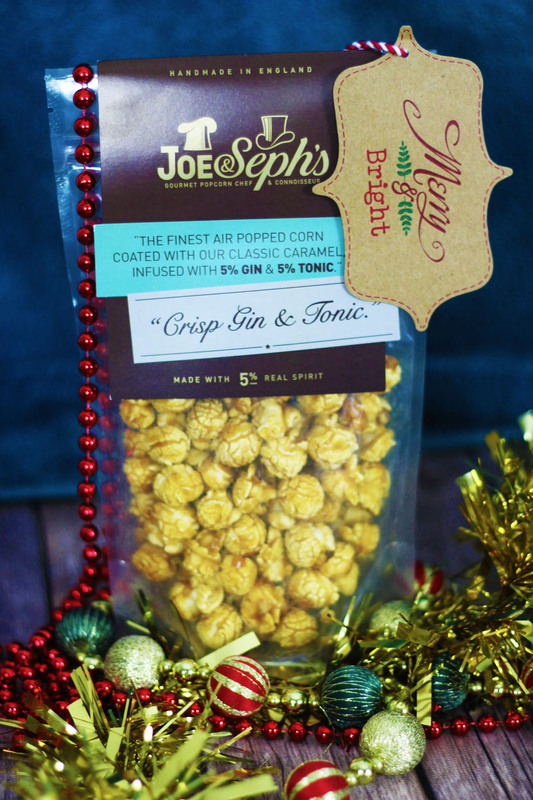 Officially voted the best tasting popcorn brand, they are a lovely little gin infused treat. 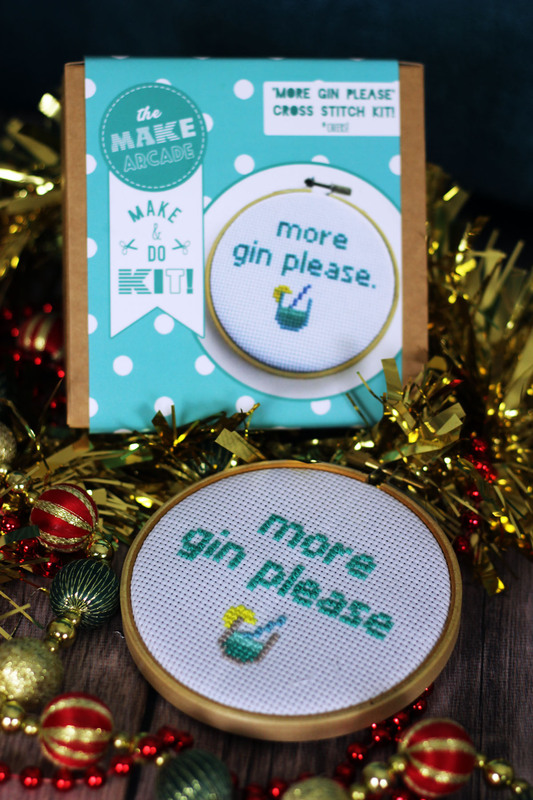 For the crafty gin lover, this adorable ‘Gin Please’ cross stitch kit is a lovely gift idea. Perfect for secret Santa at work or putting in your partner’s stocking! I had great fun making this cross stitch and it’s bound to help fill the gap between waking up and opening presents, and your first G&T before lunch. Suitable for gin lovers of all ages this is a real winner. The London Chocolate Co. seriously know what they are doing when it comes to making chocolate. 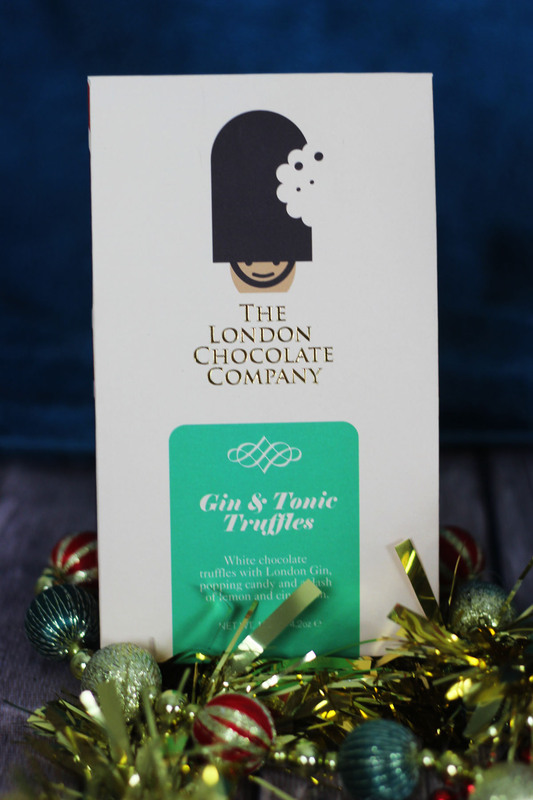 These boozy gin truffles really pack a punch – there is no mistaking there is gin in here! Watch these disappear while the Queen’s speech is on TV… But if you do by these for your better half, don’t expect them to share, there’s only enough here for one! 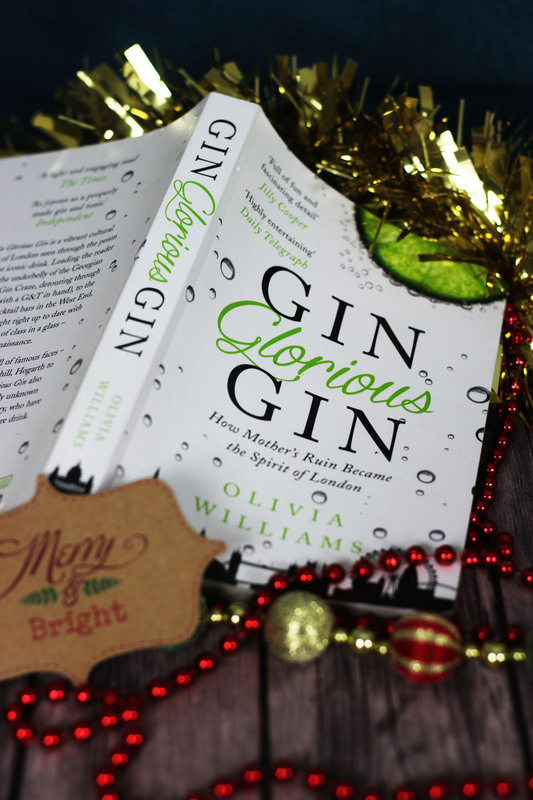 I had the pleasure of meeting Olivia back in the Summer and have read Gin Glorious Gin myself! Expect laughter, shock and tears from this fantastic book charting the history of mother’s ruin. 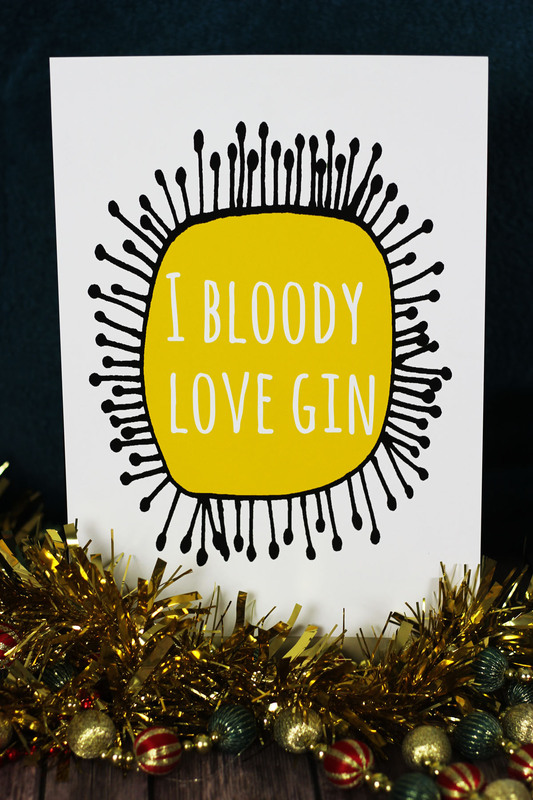 This fun and playful print from Kelly Connor Designs screams “I Bloody Love Gin!” Who doesn’t?! It’s the perfect gift for those who are loud and proud about their love of gin. Do note the print doesn’t come framed so consider whether you want to mount it before wrapping. Pssst. If you like this, then watch out for my Competition coming soon to win more gin-tastic gifts from Kelly Connor Designs including a tea towel, tote bag and mug as well as a few other treats! This fun cushion cover can be personalised to read the name of the gin lover you are buying for. I can see it now… “Emma’s gin station” taking pride of place on my sofa. I must mention this one to Santa. Part of Bespoke Barware’s cockney rhyming slang series, the Vera Lyn (aka gin) mug is the perfect piece of quirky bar ware for gin lovers. Vera Lynn is glazed in army green and then each piece is hand-painted to include gorgeous eyes and bright red lips. This is one of my favourite gifts on this list and I secretly hope Santa has taken note! Blackwater No5 gin really is something special. It’s the first Irish gin to hit the market so with a bit of luck your gin loving friend won’t have tried it yet! It has a really crisp flavour is as a result slips down with ease. Find out more on my original review post. This kit for gin cocktails includes all the boozy ingredients you need for five drinks: four cocktails and an extra measure of gin left over as a nightcap. The recipes and measures are included so all you need to worry about is adding the ingredients in the right order – this might get more difficult when you are on drink number 5! Adnams have recently had a facelift making it a cool addition to the Christmas tree this year. 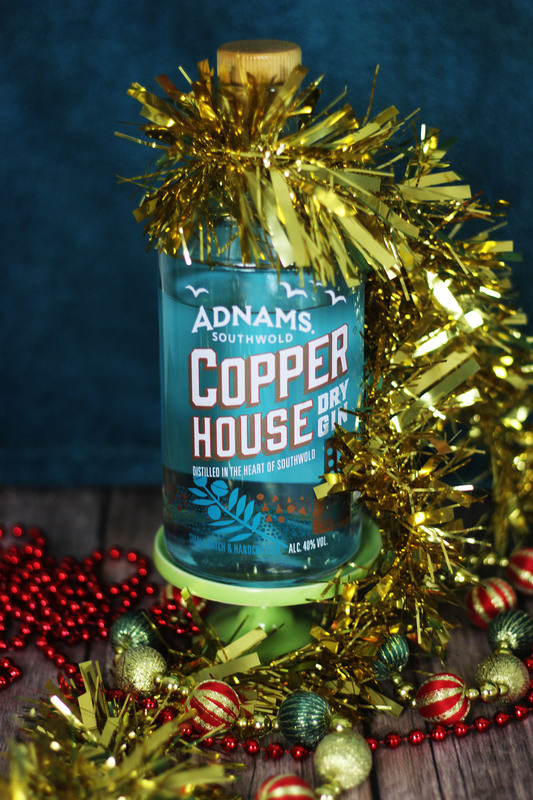 Distilled in a beer stripping column, before being put through a handmade copper pot still Adnams gin has a really creamy finish making it like no other gin. If I could only drink one brand of gin for ever more, that brand would be Professor Cornelius Ampleforth. The range covers sweet and spicy Old Tom Gin, the powerful Bath Tub Gin and fruity Sloe Gin so there is something for everyone. The bottles are beautifully designed and would look fantastic under the tree on Christmas day. 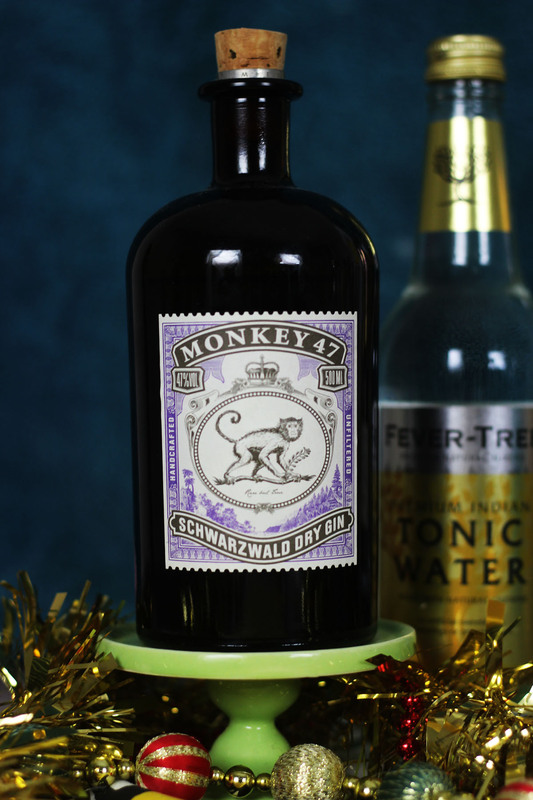 Monkey 47 is a complex, rich gin that comes from the Black Forest in Germany. It gets it’s name from the 47 botanicals used to make the gin, including the rather festive cranberry making it the perfect Christmas gift. 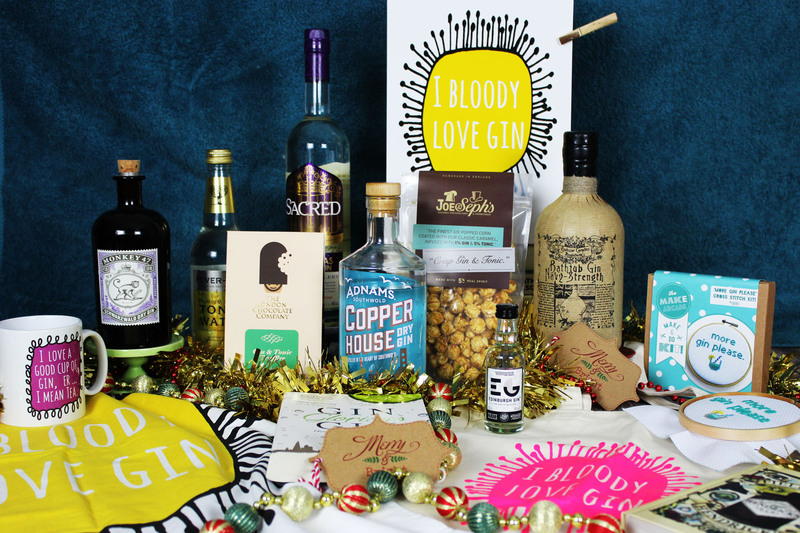 For the green fingered gin lover you can’t do better then this Take it Slow Gift Crate. The crate contains three young sloe bushes which are ready to plant. The fruit can then be harvested to make sloe gin for years and years to come! Tea towel, check. Mug, check. Tote bag, check. 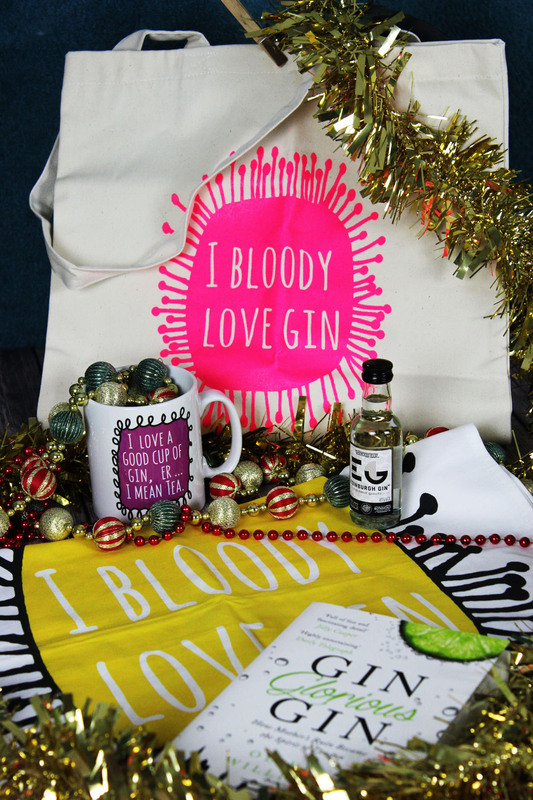 It’s the ultimate gin lovers gift set! These designs are so playful and all of the products are made to a very high standard. What’s not to love? Psssst. come back soon when you can enter my competition to win this fantastic kit and other gin themed gifts. This clock will assist the gift recipient accurately declaring GIN O’CLOCK with it’s easy to read bright and colourful clock face. A fun addition to any kitchen! I am a huge fan of Professor Ampleforth’s work so when I found out they now do 1.5litre MAGNUM bottles of gin I was ecstatic! Great value gift for any bathtub gin fan. The Gin Voyage sets sail from Kings Cross. Guests receive 6 cocktails and 2 samples of spirit. There is a captain and a Gin Guardian aboard too! 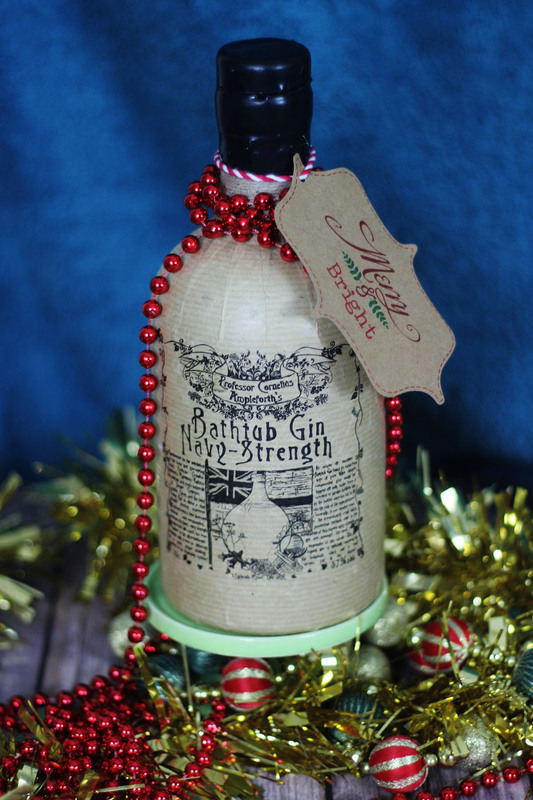 This is a gin-filled Christmas present with a twist! At The Ginstitute you will have a fun filled day learning about the history of gin, the science behind its distillation and the delicate balance of botanicals before making your own signature gin! A dream gift for any gin enthusiast. Are you a gin fan? Am I missing a gift you’d love to receive under the Christmas tree? Why not drop your suggestions in the comments below. Or give the hint to Santa and share via Facebook, Twitter or email. Supper in the Suburbs encourages you to drink responsibly. For advice on sensible enjoyment of alcohol please visit Drinkaware. What a great gift guide! I love the look of the Bath Tub gin and those tea towels are hilarious! Thanks Kate 🙂 I’m glad you like them. I think the designs from Kelly Connor are so fun! I’d happily have the tea towel taking pride of place in my kitchen! I would love all of these. Especially the love gin print. That would go well in my office. Good idea Lucy 😉 that should give him the hint! Don’t forget to enter my competition on Sunday when you could win the tote and more! WOW,it’s amazing idea you shared.Love to follow this next Christmas.Thanks mate! !